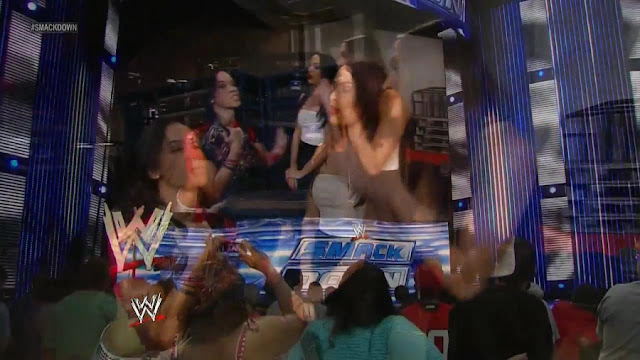 Kaitlyn ends up chasing AJ backstage as we go to a break, then we come back to see AJ trying to get away before she runs into the Bella Twins. They tell AJ to enjoy her title because they will take it pretty soon, then AJ runs away and ends up finding Big E Langston down the hall. She tries to urge him to leave, but he chuckles and asks what about Dolph, because he’s still in the building. AJ says she will text him and she needs to leave, then she freaks out a bit and tells him to hurry. Langston laughs a bit and follows her, then she yells at him to run to the car and takes off into the garage.